Latest Control4 OS release adds native Amazon Music and Deezer HiFi streaming services and new When >> Then personalization capabilities. SAN DIEGO--(BUSINESS WIRE)--Sep. 6, 2018-- Control4 Corporation (NASDAQ: CTRL), a leading global provider of smart home solutions, today released the latest Control4® OS, version 2.10.4, which expands music streaming and hands-on personalization choices for homeowners with new native streaming services and When >> ThenTM features. Music is central to the smart home experience and with its latest release, Control4 delivers even more choice to homeowners with the addition of Amazon® Music and Deezer HiFi® to its expansive music streaming integrations. Additionally, with the new “Add Music” capability, Control4 homeowners can add one or more music services directly from a mobile device or Control4 Touch Screen. In addition to the new services, Control4 also directly supports the streaming music services from Deezer®, iHeartRadio®, Napster®, Pandora®, SiriusXM®, Spotify®, TIDAL®, and TuneIn®. The needs, schedules, and interests of Control4 smart homeowners evolve over time, requiring changes to the automation in the home. Control4 When >> Then capability delivers unprecedented hands-on personalization, empowering homeowners to adjust certain functionality of their smart home systems independently, without the involvement of a dealer. New When >> Then enhancements include the ability to create and edit voice scenes for Amazon Alexa, create custom buttons and programming for Control4’s recently introduced Intercom Anywhere, and modify schedules for lighting scenes. Additionally, dealers can now unlock their programming added through Control4 Composer Pro software, enabling homeowners to modify and add to pre-existing programming through When >> Then. Control4 [NASDAQ: CTRL] is a leading global provider of automation and networking systems for homes and businesses, offering personalized control of lighting, music, video, comfort, security, communications, and more into a unified smart home system that enhances the daily lives of its consumers. 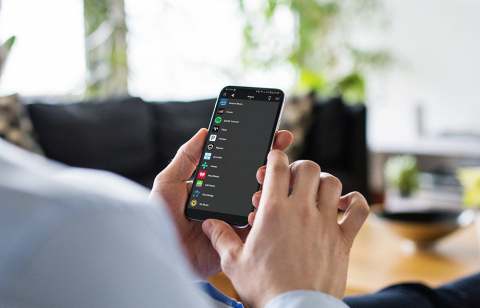 Control4 unlocks the potential of connected devices, making networks more robust, entertainment systems easier to use, homes more comfortable and energy efficient, and provides families more peace of mind. Today, every home and business needs automation horsepower and a high-performance network to manage the increasing number of connected devices. The Control4 platform interoperates with more than 12,000 third-party consumer electronics products, ensuring an ever-expanding ecosystem of devices will work together. Control4 is now available in approximately 100 countries. Leveraging a professional distribution channel that includes over 5,700 custom integrators, retailers, and distributors authorized to sell the full-line of Control4 products, Pakedge branded networking solutions and Triad Speakers, Control4 is delivering intelligent solutions for consumers, major consumer electronics companies, hotels, and businesses around the world.Control4 was named to Fortune Magazine’s 2018 list of 100 Fastest-Growing Companies at spot #48.